Swagbucks is one of the well known online money making programs similar to Clixsense. Swagbucks is portrayed as a survey panel by most of the users and marketers. Actually, Swagbucks is more than a survey panel that helps internet users both to earn money and save money through its stunning features. Definitely, Swagbucks is a legitimate get paid to site and not a scam. Read the Swagbucks review and learn how to earn and save money on Swagbucks. Swagbucks has begun its journey on 2005. It is the sister of MyPoints, run by Prodege LLC. It is home to 15 million members who make money from home. Swagbucks have already paid millions of dollars in cash & gift cards and still continues its journey as one of the largest rewarding programs in the developed countries. Sign up on Swagbucks today to get $10 free bonus to kick-start. Unfortunately, Swagbucks does not work for worldwide users like Clixsense does. Swagbucks is specially crafted for internet users from tier -1 country i.e., only people from the following countries can earn something on Swagbucks. The countries are the United States of America, United Kingdom & its brotherhood, Canada, Australia, New Zealand and selected countries from Europe. Swagbucks also support Indian users, but I think it’s not worth to use Swagbucks from India. If you’re not from one of the countries listed above, better check out this list. Get paid to industry is all about reaching a huge amount of users within the shortest time as possible. Swagbucks made it possible to widen its user base within a few years from the date of commencement. One of the reasons for its success is the year it was started while there was no major competition. The two things that can make a rewarding site successful is its age or the initial advertising investment. Swagbucks remains in the first category where they started their project in the beginning stage of second-generation internet. They continued to build trust over time. Now millions of members are the part of their family enjoying to earn money. And they are still recruiting members through different channels. Without any hesitation join the Swagbucks community earn and save money using various in-site features. Swagbucks will remain one of the best rewarding sites in the top 10 list with plenty of years to come. These are the earning opportunities available on the Swagbucks to make money. Remember that Swagbucks is not just a survey panel, it has several options to earn money. While the main categories remain the same for all the users, the available opportunities will vary based on the country from where you use Swagbucks. The Swagbucks Gold surveys is the main category in Swagbucks to earn SB(money). Swagbucks will automatically showcase the list of surveys available for you by analyzing some factors. It includes the demographics, interest, profession, hobbies, marital status etc. Fill in your profile correctly to get the opportunities to take relevant surveys. Taking relevant surveys will ensure that you will not be screened out of the survey often. 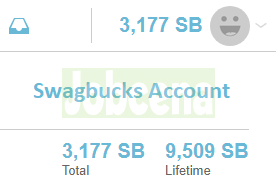 While most of the survey payout ranges from 20 SB to 80 SB, I’ve seen Swagbucks pay up to 500 SB per survey. The survey rewards of Swagbucks is not very impressive when compared to the industry standards. They should consider increasing the rewards for completing the surveys. Find hundreds of surveys on Swagbucks posted every day. Most of the users withdraw their earnings on the first day itself. You can also withdraw on the first day completing Gold surveys. Apart from this, Swagbucks offers a limited time bonus of 20% for taking Gold surveys. So, make sure to use this opportunity to reach the minimum payout threshold ASAP. In case if you don’t have the idea about how to take surveys, here is the example for you. Swagbucks surveys are mostly short and easier. However, the surveys available for each member will vary based on their profile. Here is the example of the Swagbucks survey, related to shopping. The survey usually contains a number of questions with choices as shown above. The survey taker has to read the question(s) carefully and choose the relevant answer. To get paid all the questions has to be answered. Usually, surveys might take up to a few minutes to complete. So, complete as many surveys as you can to earn more money since the Gold surveys are the most important make money category on Swagbucks. One of the best online jobs available 24 x 7 is online micro jobs. Swagbucks hosts FigureEight wall to provide micro jobs to their users. There is no limit in the number of microtasks you can complete in order to earn money. Complete as many tasks as you can the entire day to earn money. Here are some of the microtasks available on Swagbucks – Data entry, captioning, Copywriting, Translation, data processing, data mining, editing, annotations, data validation, transcription, image processing, quality rating, verification, captcha entry, video comparison, identifying violations etc. Since they host the third party micro tasks, the pay per task is less compared to other hosts like Clixsense. On average earn 1 SB to 50 SB for completing a task. Do you know you can earn money by watching videos? Swagbucks is one of the sites that rewards you just for watching videos. Although the pay per view is not so impressive; if you can run the videos throughout the day, you may see a decent amount of SB credited to your account. So, if you’re running your device in your office Wifi, don’t hesitate to play the video in your idle device to earn free SB for almost doing nothing. The pay per view will vary in different countries. Usually, the users have to watch a sequence of videos in order to get paid. So, use Swagbucks to earn money for watching videos when your device is idle. The Swagbucks daily poll is not going to help you to earn a lot. It’s just a way to learn things from the Swagbucks community and at the same time complete the To Do list to earn the daily bonus. Earn 1 SB daily by answering Swagbucks poll. Discuss with the community of worldwide users to grow your knowledge plus have some fun. Nothing more impressive, It’s just another feature to earn money on Swagbucks. 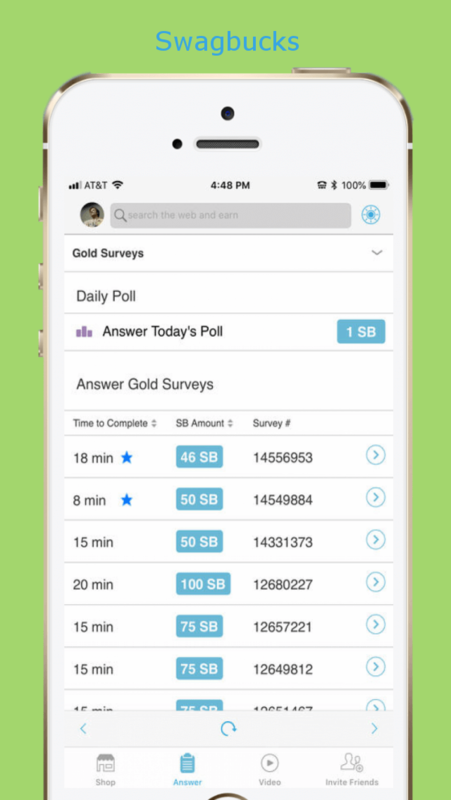 If you’re unhappy with the Swagbucks Gold surveys, the survey daily surveys and the survey partners are the ones going to rescue your goal to make the most. The Daily survey on Swagbucks contain the survey routers of major market research companies. It allows you to search for surveys throughout the day. While the Gold surveys will be limited in numbers, daily surveys will help you to find additional surveys. And in the case of survey partners, Swagbucks have installed the PeanutLabs surveys and Pollfish in addition for providing more opportunities. The PeanutLabs is the survey wall that lists customized surveys based on the user interest. You can complete those surveys to earn additional money. Similarly, the Pollfish is very simple market research company that pays for answering simple questions. Usually, the Pollfish appear as side tab whenever new opportunities are available. Answering Pollfish will be simple like answering profile questions. Searching the web is the most performed action by the internet users. To search for something, you might have to depend on search engines like Google, Bing. If you can replace the default search engine to Swagbucks search, you can earn up to 50 SB per day based on the number of searches made. Be advised that Swagbucks won’t pay for spam searches. Use it like you use the other search engines. While the in site search can grab you only a few SB, making it as browser’s homepage will definitely help you to accumulate enough SB at the end of the month to withdraw it to your wallet. If you’re worried about the accuracy of the search results, just remember that it’s the part of Bing Rewards. Bing and Yahoo search make more than 20% of share in the internet search. Apart from the opportunities listed above, the Swagbucks hosts the OfferWalls of third-party advertisers. These OfferWalls will list hundreds of paid offers in different verticals available in your country. You can complete those offers to earn some extra money. Swagbucks work with top advertisers in the categories including Adscend Media, TrialPay, Revenue Universe, AdGate Media, Radium One and Fyber. Just take a look at these OfferWalls to find the new high paying offers available for you. Mostly the offers will be related to paid surveys, videos, app installs, opt-in, trails, listening to music etc. And the pay per offer ranges from a cent to few dollars. Do you like to play games? Swagbucks has got some options to earn money by playing games. Simple games to time pass and at the same time add some SB to your account playing it. Avoid the luck based games to prevent losing your money for nothing. The features mentioned above will help you to earn money on Swagbucks. Here are some ways where you can save the money in your wallet wisely using Swagbucks. Though Swagbucks is not the best site to earn money shopping like it’s sister site MyPoints, it has got cashback offers to save money. Save up to 30% while you shop in top brands like Amazon Walmart, Target, and Starbucks. Also, print grocery coupon code to save money on stores while purchasing grocery products. Swagbucks pay few SB for printing coupons and apart from this, you can claim the discount in the relevant store. Instead of working hard to earn money, you can save money using the cashback offers posted on Swagbucks. Redeem Swagcodes for SB. The Swag codes are free codes posted in the social media pages of Swagbucks, extension and the mobile app. Just grab the Swag code(s) and enter it in your account to earn free money. Be an active member on Swagbucks and their social media pages to grab more Swagcodes. Earn 2 SB for free by updating your profile on Swagbucks. Swagbucks made the profile updating process very easy and simple by listing it in the sidebar while you check for the Swagbucks Gold surveys. Swagbucks will list the profile questions when it has to be updated. Each contains 10 questions that might take up to few seconds to complete. Earn 2 SB for answering 10 questions and at the same time keep your profile up to date. Apart from earning and saving money features, here are some of the additional features of Swagbucks to assist you. The Swagbucks referral program is available for Swagbucks users from supported countries. Share your referral link on Social media and blog to earn up to 10% referral commission. The nature of the referral program will vary based on the country where you use Swagbucks. After signing up, check your account to find the terms of the referral program. Install the Swagbucks extension available for the Google Chrome or Mozilla Firefox web browsers to earn 50 SB for free. The bonus reward will be instantly added to your account once you add the Swagbucks app extension. In addition to the bonus, it will help you to find the cashback offers while you shop online. Also, get alerts when new coupon codes are available. Swagbucks will automatically apply the coupon code during the checkout process while you shop online. Swagbucks extension remains the best featured tool for the Swagbucks users to save money almost doing nothing. Now you would have got an idea about the options available on Swagbucks to earn and save money. Here are some of the tips to earn more money on Swagbucks. Regular users earn a minimum of $200 per month on Swagbucks spending up to an hour per day. The first thing you can do is update your profile correctly. This is done to unlock high paying surveys relevant to you. Get more chances to take surveys without getting screened out often. The daily poll is created in order to make the users log into their account daily. Answer the daily poll and go to your dashboard in order to find the opportunities available for you. Set your own daily goal on Swagbucks, achieve the goal to earn the bonus. The daily goal will urge you to complete the tasks to achieve your goal. You will earn enough SB plus free bonus when you reach the daily goal. Use the Swagbucks mobile app to earn money using mobile phone. The Swagbucks money app is available for the Android smartphones and iPhone. Complete your To Do list to earn bonus SB. The To Do list contains seven items. You must complete all to earn a free bonus. This is similar to Daily goal. It will help you to accumulate SB step by step to make enough to withdraw a good amount of cash at the month end. Refer your friends and colleagues to generate passive income. If you have a hard time working on Swagbucks, the referral program will help you to earn a good amount almost by doing nothing. The Swagbucks reward store has plenty of reward options to withdraw your earnings. The minimum payout is just $3. What is the value of 1SB? It is estimated 70 SB is equal to a United States Dollar. This might vary across different countries. Redeem you SB for PayPal cash starting at a minimum of $5. Your PayPal ID should match the account ID in order to withdraw your earnings through PayPal. Apart from cash, you can also redeem SB for gift cards of big brands. The availability of the gift cards will vary based on your country. Here are some of the mentionable brands – Amazon.com, Target, Steam, Macy’s, Facebook, Google Play, Xbox. You can also donate your money to the charity such as Action Against Hunger, American Red Cross, Breast Cancer Foundation etc. Swagbucks is one of the leaders of Get paid to industry. Swagbucks is very legitimate and pays the users on time. You can both earn and save money on Swagbucks. New members get a bonus of $10. Swagbucks have more than 10 options to help you earn money. Swagbucks app and extension helps to find more opportunities. Very good support team to answer your queries. Ability to withdraw as cash and gift cards. Referral program for passive income. Not the best in its category. Low payout for surveys compared to other sites. A bit confusing for the new users. Not reliable like freelance sites. Find words on Swagbucks – Scam or Legit? Swagbucks is the legitimate rewarding site to make money and save money. It’s up to the users how much they can extract from Swagbucks. Give a try today and get a free $10 sign up bonus!